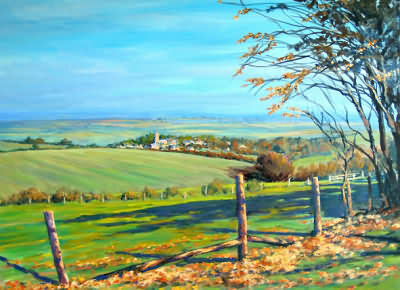 Sue Is well known locally and paints in her own studio at her home in Tetbury, part of the beautiful Cotswolds. Art has been a lifetime interest but since her retirement has taken to painting seriously as a part-time professional. Sue originally studied with Trevor Waugh, who has his studio and gallery in Cheltenham, for over 4 four years following a traditional and modern approach to painting in oils and watercolours. As an Associate of the Trevor Waugh Studios she is always being encouraged by Trevor from whom she has gained most of her technical ability and to whom she is greatly indebted. She has also been encouraged, given advice and knowledge by K B Hancock, well known and prominent artist who lives in Tetbury. Sue is producing excellent work which reflects her love of light and colour especially in oil and watercolour particularly in the way in which she uses colour and the different mediums available. She likes sketching on the spot and painting whenever possible “en plein air” but also uses photographs, taken at the time, to back up her work in the studio for reference. Her photographs are also of a high quality and are a great source of inspiration. She also teaches in St. Michael’s Catholic church hall in Tetbury, gives demonstrations and holds workshops to help and encourage others in their artistic pursuits. Her love and enthusiasm for the countryside and interaction with the places she visits is evident in the pictures she paints, whether it be figurative, seascape, landscape or the local scenes of places here or abroad. 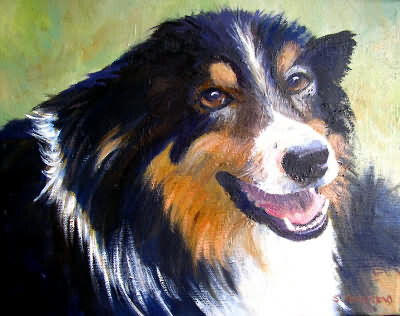 Portraits of pets have given a new dimension to her portfolio. “When asked what I like to paint I say that I have no definite subject theme that I follow – I like to paint whatever gives me inspiration or pleasure – With a brush in my hand I am never bored”. Sue has sold many paintings by holding her own solo exhibitions and regularly exhibiting with local and national societies including the Tetbury Art Society, Mayfair, Clifton Art Club, RWA Friends and RWA, W.H. Pattersons in London and has also exhibited in France, Majorca and Malta. Her artistic popularity is growing and collectors of her work are always present at her exhibitions. Visit - Sue Townsend's website at - www.suetownsendart.co.uk.